The weather patterns this winter had been woeful, day after day bringing dry windy conditions and cold crisp star filled nights. At last for Friday and Saturday the synoptic chart forecasts had something different, a trough system. There was also the lure of perhaps some moisture, but this was always going to be the ingredient that would be unreliable. On the positive side was a significant cold pool of upper air encroaching the area during Saturday. Lastly a strong jet stream was forecast, although not in the most ideal position with little to no divergence. Early Saturday and the skies were clear and the wind calm. The temperature quickly rose to around 20C, which for early August is not too bad. 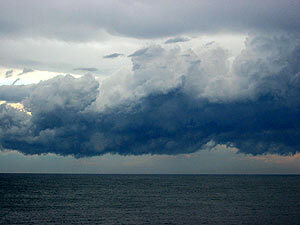 A moderate NE sea breeze was blowing by midday. The seabreeze however was shallow and I knew it would not be a major factor in storm development away from the coast. By 1pm some weakish showers had appeared on radar over the ranges. I did a visual and saw some weak anvils. 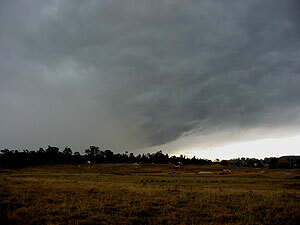 I decided to chase as I knew there would be another hour of heating before the cloud reached my target area ( Bowral ). I also knew that the upper air would cool later in the afternoon. 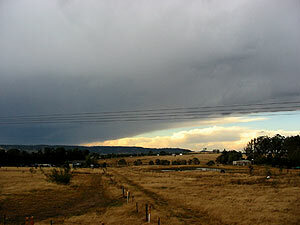 Conditions on the southern highlands looked rather grim. It was now cold, and with the cold upper air too many small cells had glaciated quickly. Simply put the sky was a mess. To the north and lower elevations the sky looked clearer so I headed that way seeking warmer surface temperatures knowing that better storms with stronger updrafts may develop. 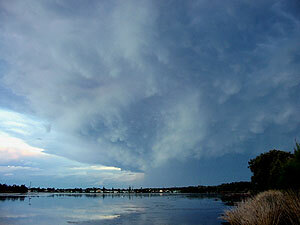 I encountered a stronger storm near Bargo. This storm had very heavy rain and a few nice CG's. I noticed that some flashes in the rain appeared purple. At picton I emerged once more into clearer conditions. There was a larger storm with a stronger updraft evident further north - I later learn't that this storm had produced hail at Penrith. 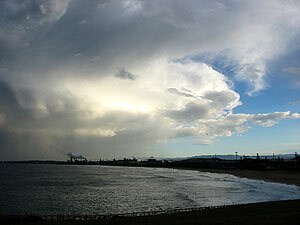 From Picton I followed the Bargo storm SE towards Wollongong. It was travelling at a rate that I could not gain on and by the time I reached the coast the storm was already 20-30kms out to sea. The interface between the storm outflow and the seabreeze was interesting, firstly as a detached gust cloud, then convecting into a line of congestus. Not a bad start to the season. None of the three storms I encountered were severe, nor do I believe that there were supercells on the day, even the severe storms looked rather disorganised from a distance.